Suede, in all its buttery-soft glory, can add rich texture to any ensemble. Here, The Rake team selects their favourite pieces for the new season. Suede's vulnerability to rain damage makes wearing it a bit tricky, however, now that we're on the other side of winter, it’s time to embrace it. 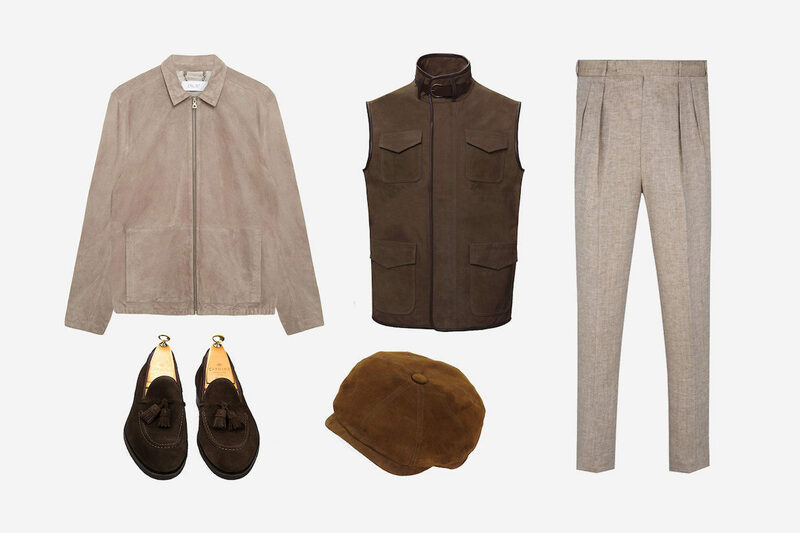 Whether dressing up a casual ensemble with a louche goatskin motorcycle jacket or topping off a tonal look with a baker boy cap, a suede garment will always add a luxurious and sophisticated touch. Suede is complicated and high maintenance, but by Jove does it stand out. It is sensual and comforting, giving a sense of luxuriousness as well as an intrepid, outdoor ruggedness. You can play the pioneer or the mogul with suede, and when it comes from Cromford Leather Company, there are few to match. This gilet could easily double as a shooting vest, with four large patch pockets, the bottom of which can carry anything from several cartridges to a box of Behikes – the agony of choice. But for a weekend city look, pair it with this collarless denim shirt from 100Hands and Calabrese 1924 scarf. I have, in the past, been opposed to suede – perhaps because I’m a bit slack when it comes to taking care of my belongings, and it seems to be on the high side of the maintenance spectrum. But I’m slowly coming around to its virtues, including the rich patina that it inevitably develops. This Richard James piece has all the trimmings, including tortoiseshell buttons, epaulettes and a belted waist, finished in chocolate brown suede. If a full coat is too much, opt for a pair of sleek suede shoes – like these Carmina loafers ­– which are a formidable choice for spring. London has become a little more colourful and vibrant thanks to spring’s well-overdue arrival. As such, one can now bring out those suede pieces that have been patiently waiting in the cupboard. I’ve had my eye on Enlist’s sandstone bomber jacket for some time – it’s a great piece for weekend jaunts about town. As ever, I like to keep things fairly tonal, so I’d pair it with some high-waisted trousers, care of Anderson & Sheppard, cut with two forward-facing pleats in a lightweight linen, and anchor both of them with a plain white T-shirt from Falke. Simple. Suede takes centre stage when crafted into a piece of indulgent clothing, such as Thedi Leathers' black goatskin suede motorcycle jacket. For a trans-seasonal ensemble (necessary in England), pair this jacket with a simple pair of selvedge edge jeans, an Enlist grey ribbed merino wool roll neck sweater and a pair of Rubinacci black Marphy deerskin leather tassel loafers. Apart from the essential need to douse it in protective spray, a suede jacket is a fantastic garment, and Chapal’s AE 1932 jacket in rich tobacco is one such example. Taking inspiration from the heroic aviator Amelia Earhart, it is both practical and stylish, featuring two generous front patch-pockets, knitted cuffs and hem and a cotton lining. Contrasting tortoiseshell buttons also give the design a modern edge. Pair with hues of beige, caramel or brown to complete a tonal combination.